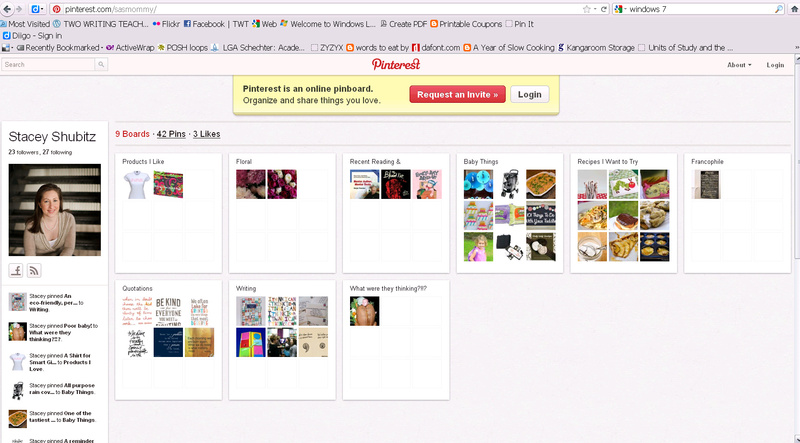 A View of My Pinterest Boards: Click to enlarge or go to http://pinterest.com/sasmommy. A couple months ago I started seeing images that had the words “via Pinterest” on my friends’ Facebook news feeds. It took about a week ‘til my curiosity was piqued enough to find out what Pinterest was. Once I found out what it was, I requested an invite. Once I received a Pinterest account, I installed the Pinmarklet on my Firefox toolbar and started pinning images that I wanted to remember to my boards. At first, I mostly pinned baby things or recipes I wanted to try. However, in the past couple of weeks, I’ve started pinning book covers from books I’ve recently reviewed on TWT (big surprise) and writing-related things (another big surprise). For me, Pinterest is about jogging my memory into remembering to buy an item, investigate something, try a new recipe, or to read further. In addition to being a memory jogger, Pinterest is also about inspiration. I’ve been pinning quotations and even floral designs. My home office’s walls will only accommodate so many things. Therefore, I need something like Pinterest to help me gather pictures of things that inspire me. What I love about Pinterest is the ability to see what my friends and the world at-large is pinning on their boards. 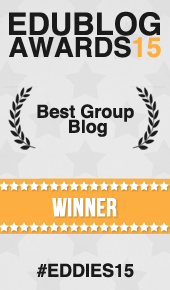 Many of the things I’ve pinned are re-pins from other people’s boards. In fact, I recently made Campfire Cookies for dessert, which is a recipe I picked up from a total stranger’s pin board. When I made the cookies, which are essentially s’mores without the campfire, for Thanksgiving, I knew I had to blog about the merits of Pinterest sometime soon. A little more out of my comfort zone is Twitter. While I’ve known about Twitter since the Summer of 2007, I’ve resisted using it since I didn’t feel that the world really wanted to hear about every thought or musing I had. Ruth started using Twitter nearly two years ago. Since her announcement about her page on TWT, I started unofficially following her Twitter Feed (which I think shocked her when I told her this in Chicago two weeks ago). By watching her feed, I’ve learned about the ways Twitter can be used in the classroom. In addition, from reading through some other people’s Tweets, I have come to realize that Twitter is an excellent way to exchange professional articles and presentations. Everywhere I went at NCTE, I seemed to hear the word “Twitter.” Several people I knew presented with people who met on Twitter. I thought about trying it out, but wasn’t sure I had the time Twitter right now. But then, a few nights ago, as I was preparing to begin my life with an iPhone, I had a moment of weakness. I’m always sharing articles that interest me on the TWT Facebook page, on my personal Facebook page, and with family via e-mail. Why not have a designed spot for sharing articles that interest me? To that end, I figured I’d be able to find more interesting articles by following other educators (and media outlets) I trust. Knowing I could post articles to Twitter from my iPhone, I figured that it was worth a shot. Wanted “iraisealiteraturehuman” as my user name, but it was too long. Not sure how I feel about brevity and Tweeting, but I may just try it. I’m not sure that I’ll be an active Twitter user, but just like Pinterest, it’s worth learning and trying. Oh, and by the way, my username on Twitter is “raisealithuman.” It summarizes my most important job description right now, in addition to reflecting what most of my article links will be about, which is about literacy and parenting (and if I’m lucky, the combination of the two). I love Pinterest. It brings only positive emotions and inspiration. You can use it as seldom as you wish. I am still hesitant to join Twitter. Sometimes i think I should take a long break from Google reader and internet altogether just to be, and do other (screen-free) things. I LOVE Twitter. I’ve met so many educators and authors on there, my classroom has benefited greatly. Good luck! Love Pintrest! Search Anchor Charts (or any other educational term) and you will be amazed at what you discover. Some of the best PD resources! I searched ‘summarizing’ and had a ton of useful resources that I used instantly. I was considering offering a Twitter / Pintrest info lunch to the faculty. Your post encourages me to do so. I’m tweeting, as you know, but it’s not the first thing I think of in the am, mostly it’s still e-mail & facebook. Maybe someday I’ll spend time really deciding how I want to do it. I have done a little with the boards on Pinterest, but just have so little time. It looks like lots of fun. thanks for sharing Stacey! I just joined Pinterest. I haven’t quite figured it out yet! My husband (also a teacher) uses Twitter for personal and professional-separate accounts. He loves it! He accesses a lot of his news/articles from there. I’m not there yet…like you, I don’t know that people want to hear about me. Maybe sometime. As with anything, I think it’s about taking time to play. And I thought I was the only one at NCTE not tweeting! I’ve decided to give it a try, too (although I just recently joined Facebook and I’m still learning that). There is so much to learn!!! I joined Twitter this summer and it is amazing. I love how it is described as creating and hand picking your own personal staff lounge to chat and learn from those will to share and learn together. As a new mom too (my girls are 18 months old), I didn’t think I had time, but it’s about balance. In the beginning, I was sucked in and overwhelmed, but I realize now that it’s about stopping in to that “perfect lounge” when I can to sit and learn from great educators around the world! Pinterest is another addiction too. I could browse for hours alone on the Pinterest site! So many great ideas! I have been active on Twitter for 18 months. Twitter provides the best professional development resources and gives you a chance share ideas with teachers from all over the world. Try #ELLCHAT (for teachers of English language learners) on Monday nights at 9:00 PM. We’ll do a writing topic in your honor! Thanks, in advance, for the offer to do a writing topic. I’d love that! I absolutely love pinterest!! I will have to follow you! I was hesitant to use twitter at first, but now I’m so glad that I did it. I’ve learned so much from other amazing educators that I follow. Plus it’s such a great networking tool, especially at huge conferences!